Injury, like illness, is an ineluctable fact of life. In sport, elite performers are more marked by the attitude and manner with which they deal with injury than by their elected course of treatment or by the severity or frequency of their injuries. Whereas treatment and rehabilitation receive considerable attention and focus in discussing injury, compensatory strategies for maintaining or improving fitness while recovering from injury are generally given short shrift. This month we reveal the CrossFit approach to training with injury through the hypothetical case of an athlete medically restricted from all weight bearing movements for eight weeks following surgical repair of the meniscus in his right knee. Remember, our concern here is not how to “rehab” the knee specifically but how to keep the athlete training to ensure that he continues to develop while he is injured and unable to use the affected limb. Ripped hands and bloody shins give bacteria a way into your body. Dr. Mike Ray explains what’s going on and offers his tips on how you can avoid nasty infections. I have a slight pull in my left rear delt muscle, but I don't want to use that as an excuse not to train. I'm trying unilateral training with my right arm. Any suggestions on one arm exercises? As for my injured shoulder, I'm doing L extenions with bands to strengthen my rotator cuff. Any other suggestions to rehab a pulled rotator cuff/rear delt muscle? I disslocated my ankle two weeks ago and I am having surgery this thursday. This injry really put a halt to my training. A few weeks prior to the injury I started a new routine. I was just starting to see some major improvements in my strength, fat loss and definition. For the past two weeks all I have done is sit around and become a coach potatoe. The monday after my surgery I am going to get back up on the horse and start my training again. I will only train my upper body. It will be a long and rough road to get back where I was. I hope crossfit can help me on this journey. This article has made all the difference in my rehab from a back/hip injury a few months ago; just wanted to say thanks. Doing heavy deadlifts, I pulled my piriformis muscle and tore up some low back muscles, too. I tried to take it easy and stay away from anything that might tax the area, but the less active I got, the worse the pain became. Then, I read this. Not only did my attitude pick up immensely—not being able to CrossFit is a serious downer!—but the more active I was, the better I felt physically. 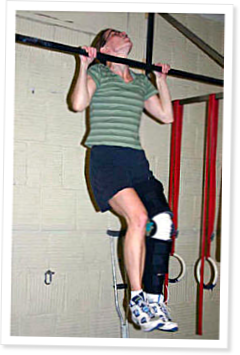 Also, the perspective shift of this article helped me refocus my efforts in ways that have really paid off... before my injury, I couldn't kip, and my pullups were only really happening because I rested one foot on a support at the bottom of the movement. Now, I've got at least ten kipping pullups, and I do at least 30 every morning, completely unassisted. (Similarly, I've improved my shoulder press/push press/push jerk numbers, deepened my range of motion in my squats, and I'm working on strict form for all my Oly lifts). The hip/back is almost back to normal, and I believe I'm a stronger, more well-rounded athlete because of this article. Thanks again. I read this article, and thought...this is supposed to be hypothetical - right? Well, I am a Crossfitter that has just torn his medial miniscus in the right knee and will be undergoing arthoscopy surgery to repair the damaged cartilage. With that being the case, I'm pretty bummed out about the fact that this will impact my CrossFit routine. However, I will be working on developing a workout program that will allow me to get as much benefit out of CrossFit during my 6 week recovery, as possible, while at the same time avoiding any stress to my right knee. I will attempt to post my findings here. Wish me luck! I am awaiting the results of a recent MRI on my right knee. I haev already had both ACLs reconstructed and am really reluctant to have any further surgeries, including another scope. I have continued my WODs as best I can, modifying for any running, but have become discouraged by pain and ROM issues. This article has changed how I view a workout and I have begun to rethink what a workout is going to look like for me in the next few weeks. Thanks. All - I just wanted to provide an update to my previous post from 12/30/2008. I just went under the knife on 4/24/2009. It has been 5 weeks since my surgery and things are progressing well. I have chronicled some of the situation at http://reflectivemedium.blogspot.com. Search for "knee surgery". Anyway, I have started working out again, with limited leg capacity yet - so mostly upper body. I start the next 6 weeks of rehab on 6/8, and will be looking forward to the strength exercising that is coming next. I anticipate being fully back to crossfit in 6-8 weeks (a total of 12-14 weeks). It has sucked, but there are worst things in life. I look forward to having a fully pain free knee and taking my Jiu Jitsu game and CrossFit game to the next level...more to come. I believe I pulled my hip flexor doing wall ball shots and back squats. I took two days off and once the pain subsided I returned on the third day but still could not do the workout without serious pain. Since that day it has gotten progressively worse even causing pain pushing the gas pedal while I am driving. On top of that probably because the way I was walking my plantar fasciaitis returned in my right foot ( same side). I hate missing crossfit and taking only three days off has made me kind of depressed. I really took for granted how often you use your hips. My injury obviously is not serious enough to have surgery, but it is debilitating. Are there any suggestions what workouts I can do during the meantime so I can return to the box. Thanks for a great article. I love the philosophy but wish the exercises were practical in my situation. I am 64 and injured with a torn meniscus. Never could do a "real" pullup, much less a rope climb or ring dips. I have crossfitted for 3 years at about 60-75% scale, sometimes 100, some things not at all, depending...All I can see to do now is pushups, pullups, situps, seated handweight exercises....what else? The article is a wonderful approach. Can you tailor exercises for the less capable? I actually had a meniscus repair and ACL reconstruction on my right knee. I came back to crossfit two weeks after my injury and did everything that this article talked about for a month. After my surgery, I couldn't come back for five weeks, but when I did, I went back to more of the same. I have gained back my strength and am doing a lot of air squats, which is a nice addition to my routine. This article was very motivating and has kept me on a 4-day a week crossfit schedule. This is a great topic because often what happens with athletes with non weight bearing injuries like these is that they stop working out until they are more mobile and can more easily get back into lifting, but often continuing to strengthen other muscle parts other than the injured limb can help the injury recover. Wastage can occur quickly and continuous strength training is needed to help prevent this. Going to the gym with a partner is often required to help in setting up exercises etc but this is vital in the beginnings of an injury instead of waiting.